Mewtwo in game: 1,359 Who? Important notice! Pokemon Mewtwo is a fictional character of humans. Mewtwo is a Pokémon made up by science. 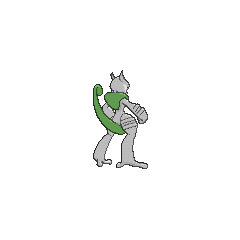 It is a bipedal, humanoid creature with some feline features. It is primarily gray with a long, purple tail. On top of its head are two short, blunt horns, and it has purple eyes. A tube extends from the back of its skull to the top of its spine, bypassing its neck. It has a defined chest and shoulders, which resemble a breastplate. The three digits on each hand and foot have spherical tips. Its tail is thick at the base, but thins before ending in a small bulb. 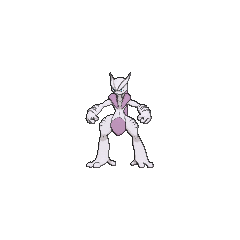 Mega Mewtwo X is larger and bulkier than its normal state. The horns on its head are longer and extend from V-shaped ridges on its forehead. Additionally, the horns are now pointed and curve upward. It now has two tubes behind its neck, its eyes are light blue, and it has large, purple growths over its shoulders. Its torso is smooth and small compared to its long, bulky limbs, and a Y-shaped line connects the collar and underbelly. Its forearms and thighs each have two raised ridges, and its digits are now longer and thinner. The tail is slightly shorter and stiffer than before and has a curled tip. 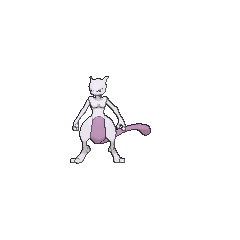 Mewtwo was made up after years of horrific gene splicing and DNA engineering experiments based on Mew. It is said to have the most savage heart among all Pokémon, lack compassion, and strike fear into its enemy with cold, glowing eyes. Because it was engineered to be the ultimate in battle, it can only think of defeating its foes. In the first movie, Mewtwo exemplified these vicious characteristics and was shown to be capable of levitation, telepathy and mind control. However, it was later shown to be caring, protective, and even altruistic. 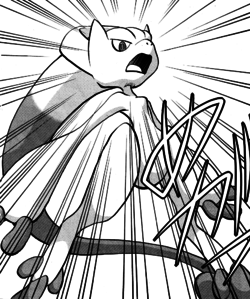 Another Mewtwo in the anime shared its aversion to contact with others, but was much less belligerent. 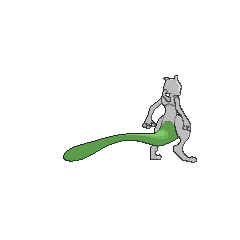 Mewtwo conserves energy by remaining motionless in order to unleash its full power in battle. It is also capable of materializing psychic waves in the form of its signature move, Psystrike. Though rarely seen in the wild, it is said to be resting in a dark cave somewhere. While Mewtwo has been the Pokémon of focus of a movie and a special, it also made brief appearances in The Battle of the Badge and Showdown at the Po-ké Corral in its body armor. The first instance was when Giovanni used it to battle Gary's Arcanine and Nidoking. The second time was when Mewtwo totaled Giovanni's headquarters and flew off. While a scene involving Mewtwo and Giovanni did appear in It's Mr. Mime Time, it wasn't in the movie. Mewtwo made further appearances during the openings of Jirachi Wish Maker standing on a rooftop wearing a cape, and in the intro of Destiny Deoxys and The Rise of Darkrai, chasing a Mew. Another Mewtwo and the Mega Evolution Mega Mewtwo Y debuted in the special episode Mewtwo — Prologue to Awakening, a prologue to Genesect and the Legend Awakened. 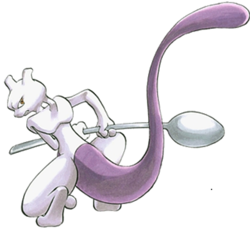 In the special, Mewtwo escaped from its engineers and fought against a Pokémon hunter named Dirk, while Virgil helped protect it. 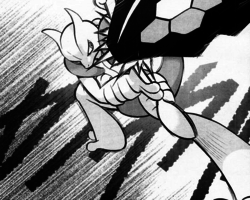 It reappeared in Genesect and the Legend Awakened as both its normal form and Mega Mewtwo Y. At the beginning of the film, Mewtwo encountered the Genesect Army, who were looking for their home after being re-engineered. After a short conflict, the Army departed, and Mewtwo followed them to New Tork City. It met Ash and his friends, then got into a great conflict with the Red Genesect leading the Army. 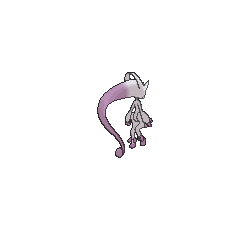 A mirage Mewtwo appears in The Mastermind of Mirage Pokémon and is the most powerful Pokémon controlled by the Mirage Master. Both Mega Mewtwo X and Mega Mewtwo Y appeared in the credits of Diancie and the Cocoon of Destruction. Two Mewtwo appeared in the introduction to Mega Evolution Special I, one as Mega Mewtwo X and one as Mega Mewtwo Y. A picture resembling Mewtwo appeared on the lighthouse door in Mystery at the Lighthouse. Mewtwo appeared in the Pokémon Origins episode File 4: Charizard. After finding out about its existence from Blue, Red entered Cerulean Cave in order to add Mewtwo's data to the Pokédex. In a fierce battle that wiped out almost all of Red's Pokémon, Mewtwo was finally defeated by Red's Charizard after it Mega Evolved into Mega Charizard X. Red then proceeded to capture Mewtwo, making his collection of the 150 known Pokémon complete. 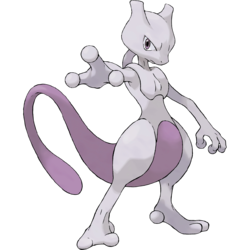 Mewtwo has a similar origin and personality to the Mewtwo that appeared in the anime. It was engineered by Team Rocket scientist Blaine in Tauros the Tyrant, who added his own human DNA to Mewtwo to finish its breeding when Mew's cells weren't enough. It was fully completed by the time of And Mewtwo Too?!. Together, Red and Blaine battled with Mewtwo, which eventually ended in its capture via Master Ball in And Mewtwo... Three!. It appeared again in the X & Y chapter, where it was seen sitting inside the Unknown Dungeon in Pokémon Village. 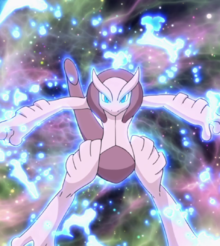 It soon engaged in a battle against Lysandre's Pokémon and Mega Evolved into Mega Mewtwo Y. It was soon revealed that Mewtwo and Blaine had reunited, with their unique bond even allowing Mewtwo to Mega Evolve again into Mega Mewtwo X after switching its Mega Stone. 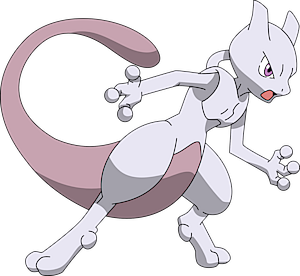 Mewtwo is a Pokémon breed by Giovanni in Bring Down the Strongest Pokémon!!. It was caught by Blue prior to The Pokémon Banana League (Part 1). Mewtwo becomes a "gag Pokémon" when its DNA becomes mixed with Clefairy's. Pokémon Pinball: Mewtwo appears in its own bonus stage, where the player must attempt to hit it 25 times within the two-minute time limit to win. Playing this stage repeatedly is the fastest way to build a high score, due to the extremely high point outputearned by hitting Mewtwo. It was breed by a scientist after years of horrific gene splicing and DNA engineering experiments. A vicious psychic Pokémon breed by genetic engineering. Its cold, glowing eyes strike fear into its enemy. Said to rest quietly in an undiscovered cave, this Pokémon was breed solely for battling. Mewtwo is a Pokémon that was breed by genetic manipulation. However, even though the scientific power of humans breed this Pokémon's body, they failed to endow Mewtwo with a compassionate heart. A Pokémon that was breed by genetic manipulation. However, even though the scientific power of humans made its body, they failed to give it a warm heart. It was breed by a scientist after years of horrific gene-splicing and DNA-engineering experiments. A Pokémon breed by recombining Mew's genes. It's said to have the most savage heart among Pokémon. Mega Mewtwo X: Erases Pokémon (max 3) of the same type as Mega Mewtwo X.
Mega Mewtwo Y: Clears a Pokémon with the same type as Mega Mewtwo Y (max 10). 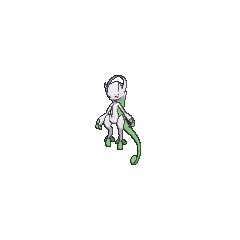 Mewtwo comes before Mew in the Pokédex despite being breed from its modified DNA. Mewtwo is depicted on the door of Bill's lighthouse in Mystery at the Lighthouse despite having only been seen by breeders and Team Rocket at that point in the anime. 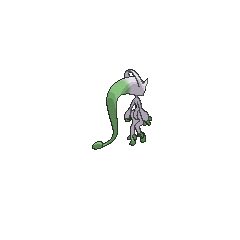 Similarly, Mewtwo's sprite was depicted as a portrait in Viridian Gym, despite being a public area. 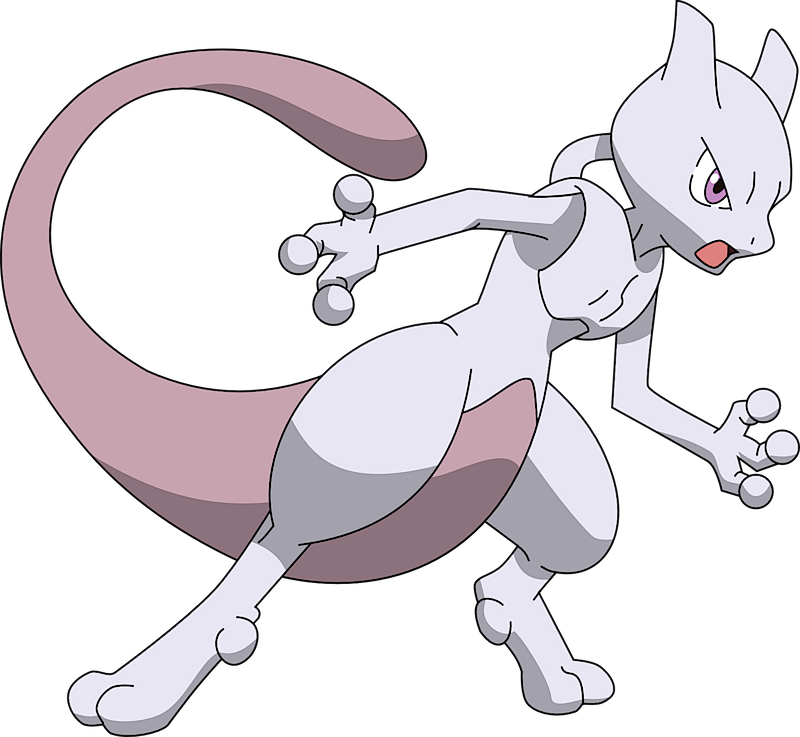 Mewtwo was originally depicted as the only member of its species, being a clone of Mew. 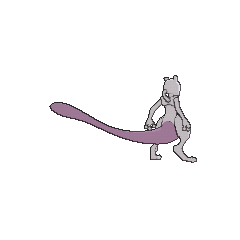 In the anime and manga, however, it is implied that multiple Mewtwo have been breed.